Our trip began with a bus hooting outside our room at 4am. The other passengers were not very chatty at this stage and neither were we. We drove in the dark for an hour or so before reaching the tiny town of Mollepata. While we had some basic breakky, the horesemen loaded up the mules with our stuff. No carrying of heavy packs for us, just a daypack with the essentials, a couple of cameras, tripod, things like that. Our group was quite big, 16 people, and luckily they were a very nice bunch of people. Our guide too was very passionate about what he spoke about, also a very entertaining guy. So after a quick introduction to get us in the mood, we began with the walking. The first day took us up through some beautiful rural mountain scenery. It never ceases to amaze me how much of the steep mountainous land is cultivated. Later on a nice lunch was provided, amazingly, the cooks were able to whip up a lunch with soup, a main and tea for all 16 of us. Then it was back to the walking. Our first camp that evening was on the plains beneath the mighty Salkantay mountain, glowing angelic white in the late afternoon sun. Another nice meal was had, washed down with a few cap-fulls of “Quanyasa” a sugar cane spirit brewed in the local shoppe, and served in an empty coke bottle out of a bucket. The next day took us up a windey path up to the Salkantay pass at a breath-taking 4600m. While we were up there taking our group happy snap, we were witness to a big avalanche from the Salkantay glacier above. For almost a minute, tonnes and tonnes of snow came rushing down the mountain like a huge waterfall. From there it was over the pass and all downhill, the terrain changing gradually from rocky and grassy, to green forest. The next day took us further down the valley, past local avo and passion fruit trees. We had dinner that night at in a small, very rural village. Not long after we got into camp the rain started bucketing down. It seemed to rain all night. In the morning we had the difficult decision of whether to continue in the wet, up and over the mountain, which would be quite dangerous on the now very wet trail, or take a bus to the next point instead. After much discussion the group was split. Me, with a few others climbed up the mountain. I was a little bit worried that of the three others, one was a very keen mountain racer, and another was in the process of cycling from Ushuaia to Alaska. The walk didn’t turn out too hard though. The rain stopped just before we started, and the cloudy vistas were beautiful, we even got a quick peek of Macchu Piccu, far across the valley, before it was quickly hidden again. Things got a bit crazy on the way down though with mountain runner John in the lead and we did the rest of the 2 hours of walk down in about 45 minutes. Sophie and the others had an equally exciting trip, having to be shuttled across the river in a rickerty cable contraption. The two groups met again on the railway to Aguas Calientes, the town at the base of Macchu Piccu. Although tired from our 4 days of solid walking, we still had the huge stretch of inca stairs to look forward to in the morning, so we tried to get an early night. Our final day began with a hard slog up the steps, in the dark, to be at the gates and in line at 5am. They finally let us in just as the sky was lightening. A few more steps up and the classic postcard view of Macchu Picchu was laid out before us. It really is spectacular, just like the postcards. We were also increadibly lucky to have a clear sunrise, and a pretty much cloudless day after that. After a guided tour, we made the hike even higher up the impossibly steep mountain of Wayna Picchu which overlooks the ruins. The trail up defies imagination, and perched right on the top are even more terraces and buildings. 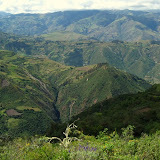 From there, there are amazing views in all directions of the jagged green mountains all around. We stayed at the ruins the entire day, right up until the last rays of the sun left the ancient walls and the guards started chasing us with their whistles. It was a really amazing day. We finally trudged down the mountain exhausted. After a fun dinner with all the crew we departed on a crazy sequence of a train trip and various bus transfers that eventually landed us back in Cusco, shivering at 2 o’clock in the morning. Adventures of Dean and Sophie is powered by	WordPress 2.8.5 and delivered to you in 0.364 seconds using 33 queries.